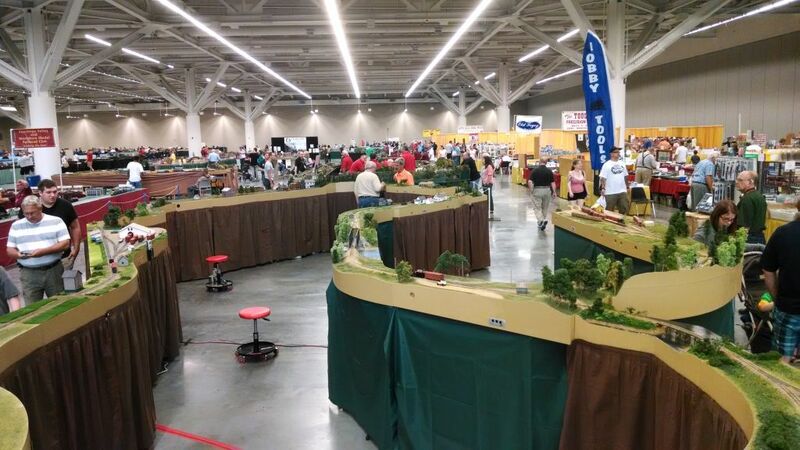 The 2014 NMRA National Convention and National Train Show were in Cleveland, OH. 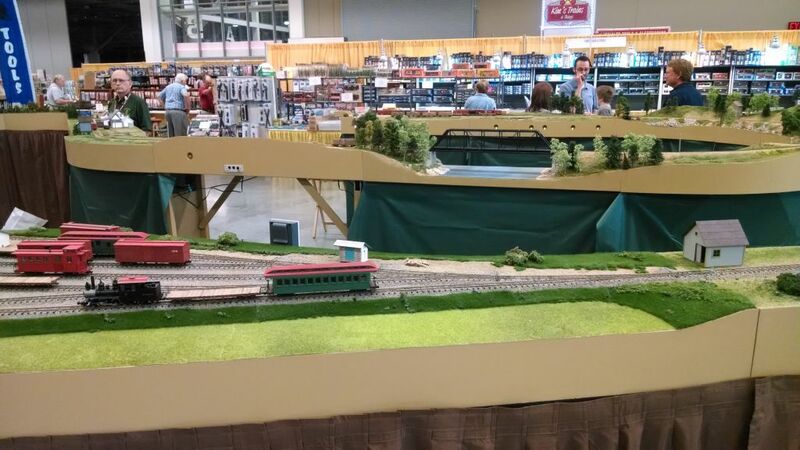 The Sn2 Crew took the opportunity to setup at the Train Show. 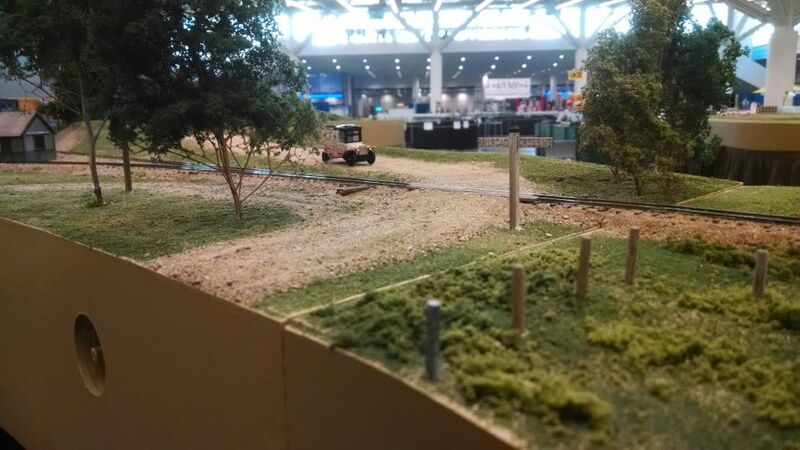 The Train Show took place in the new Cleveland Convention Center. Quite a nice venue, but it may not have been the best place to draw public crowds. During the show, I captured a few images with my cell phone, checkout below. One of the show attendees posted a video on YouTube, check it out here. Overview of the Sn2 Crew setup. 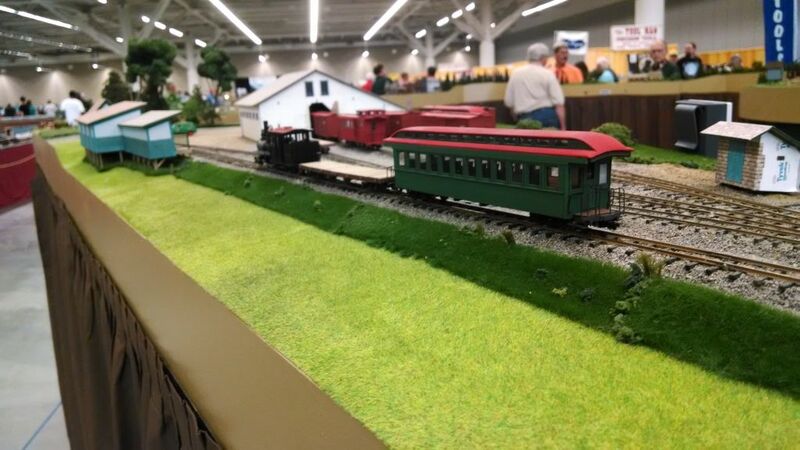 Many of the attendees at the train show commented on the free-form shape. 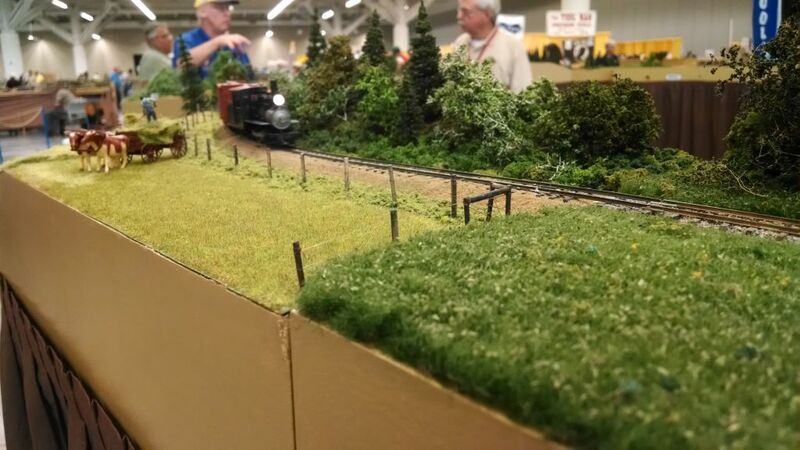 The combination of three Lee Rainey modules took second place in the NMRA module contest. The hay field module was one of those modules. Road crossing on David Keith’s South Strong Junction module. The crossing sign is from Portland Locomotive Products (PLW). A short train waits on Frank Knight’s Alna module. Looking across the layout, one can see three disinct part of the layout as it wrapped around. In the foreground is Frank Knight’s Alna, followed by David Keith’s Salmon Hole Bridge, and finally David Keith’s Bigelow module. All scenes from the Maine 2-Footers. Visitors could walk into the layout in two places. 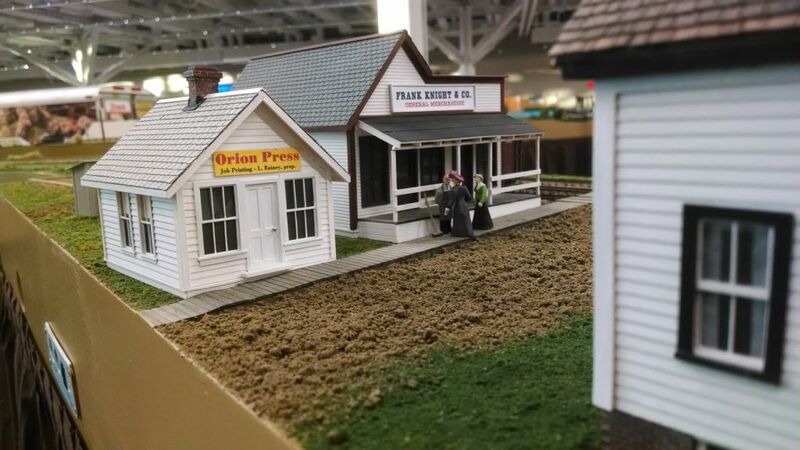 The crew mostly stood here on the main isle of the layout, but visitors were allowed to enter. To the right was an area to where many visitors entered to view Salmon hole bridge and Mapplewood as well as to see David Keith’s Carrabassett River modules. This entry was posted in Free-mo, Sn2 Crew. Bookmark the permalink. Hello from Aus, those modules look excellent to me, have started to do a bit in Sn2 myself, Paul R.
Thanks Paul. The members of the Sn2 Crew have been at it for a while. I know I have a ways to go. I’m sure you can achieve similar or better results. 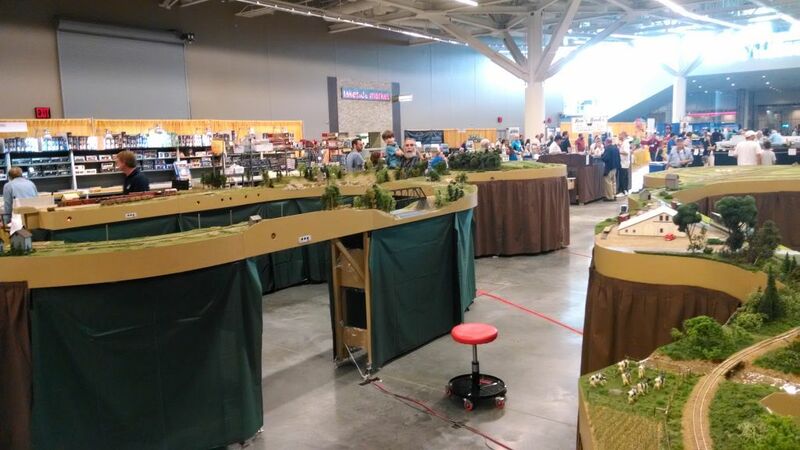 Dave K.
Well done and quite a large Free-mo layout you managed to present – especially given the niche nature of Sn2. Some clubs working in HO std gauge – with far more members – would have a hard time displaying as much, and at such a high quality. Wish I’d been there to see it in person. Well, that’s tempting but my energies are focussed elsewhere right now – and typically 4′-8.5″ between the rails.